Thank you to the founders of Hen Harrier Day for giving us the opportunity for people to take stand. 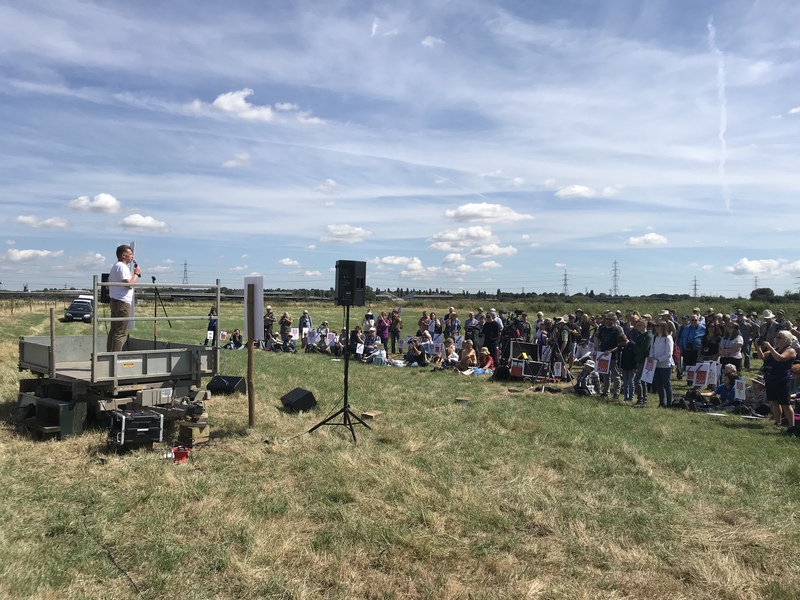 Thank you to the organisers of today’s event here at Rainham for bringing the sunshine and allowing us all to make our voices heard. Thank you all for turning up and showing you care about the plight of hen harriers and demand change. Thank you to a nine year old Isabell Haskell who, inspired by the story of hen harriers, raised more than £500 for charity (with half going to the RSPB) by cutting off her hair! Thank you to the incredible work of the RSPB Investigations team for working tirelessly with the police to catch criminals who continue to persecute our birds of prey. And a massive thank you to those that have spent their summer protecting hen harrier nests day and night. I am delighted that, this year, their dedication has been rewarded by a more positive hen harrier breeding season in England: 9 nests and over 30 chicks. One of the RSPB’s founders, Etta Lemon, established the first ‘watchers’ at key breeding sites (for species such as hen harriers) in the early twentieth century. As Tessa Boase has described in her fabulous book about the origins of the RSPB (Mrs Pankhurst’s Purple Feather), Mrs Lemon was an indefatigable campaigner and I think she would be outraged that more than one hundred years later, we still have to protect hen harrier nests around the clock. We all dream of the day when 24/7 monitoring of hen harrier nests is a thing of the past, that changes have happened that mean it is no longer necessary. Only then will we know that we have learnt to live alongside hen harriers and that their future is secure. Sadly, this won’t happen overnight and it won’t happen unless we continue to campaign for change. That is what the RSPB’s foremothers taught us. They ran a thirty year campaign against “murderous millinery” and the global plumage trade. And they didn’t rest until they secured what they wanted – the ban on the plumage trade through the passage of the Importation of Plumage (Prohibition) Act 1921. The good news is that things are shifting. In Scotland, there is a real prospect of gamebird licensing and in England, while the political context is very different, there are few outside of the die-hard grouse shooting industry who now defend the status quo. The hen harrier has rightly become totemic. Because of illegal killing, it remains at risk of extinction as a breeding species in England – something that this government promised to prevent. The parlours state of our hen harrier population is a stark reminder that we are failing to live in harmony with nature. "Living in harmony with nature" is the ultimate goal of the Convention of Biological Diversity that was conceived at the Rio Earth Summit in 1992. In 2010, the UK Government signed up to 20 CBD targets including to stop species extinctions. In just over two years, world leaders will gather in China to report on how well we are doing against these targets designed to restore nature. We want the UK Government to report positive progress. A key test of success will be what is happening in our hills, and especially the fate of species like the hen harrier. 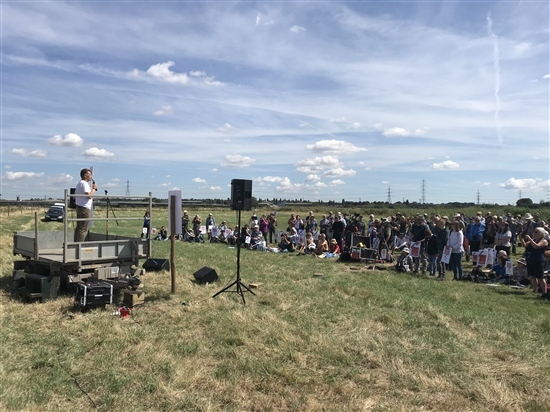 All of us attending Hen Harrier Day events across the country are sending a powerful message to landowners and politicians that the public demands urgent reform of the way our hills are managed. And to deliver the change we want, we must remain united. I know that we all have different views about how best to secure that change – some seek a ban in grouse shooting, we propose licensing. But we are united in wanting reform. Those of us that work for the RSPB follow in Etta Lemon’s footsteps which is why I urge you to remember what made those early campaigners successful: remain passionate, be persistent and above all remain united in our demand for more hen harriers and an end to the illegal killing of our fabulous birds of prey. A really great and enjoyable day Martin, thanks for your good words and those of all the other speakers. I too would like to thank the superb work of the RSPBs investigations team and all those who guarded the Hen Harrier nests 24/7 this season. I do so agree that although there are slightly different views as to how to stop the illegal killing of our birds of prey it is so important that we all focus on our end objective and that is the stopping of these killings. It is also not just the killing of birds of prey. We must also make sure all our other moorland wildlife prospers. The pictures of the killing and slaughter of mountain hares,some caught in gin traps is just disgusting. That this sort of butchery should be allowed to persist in this day and age renders this Government and those in it who have responsibility in these areas, an absolute disgrace. Good to see you, Martin. It was a special day.